Kate Middleton and her baby bump missed out on the society wedding of the year on Saturday, choosing to stay at home and rest in the final stages of her pregnancy. But boy, did she miss an eventful day. Prince Harry was an usher at the nuptials of Lady Melissa Percy and Thomas van Straubenzee at St Mary’s Church in Alnwck, Northumberland, while his ex-girlfriend Chelsy Davy was a bridesmaid. Chelsy looked stunning in a champagne-coloured dress with an embellished neckline, while Prince Harry looked dapper in his three-piece suit, which included a matching champagne waistcoat. Despite being part of the bridal party, Harry and Chelsy managed to avoid being photographed together – but Chelsy did manage to share a giggle with his brother Prince William. If that wasn’t awkward enough, Prince Harry‘s current rumoured on/off girlfriend Cressida Bonas was also in attendance. Cressida wore a blue and white maxi dress with a blue sequinned blazer and flowers in her long blonde locks. It looks like Harry avoided beige photographed with Cressida, too. Harry dated Chelsy for six years and they split in 2011. In February, the Prince was spotted hugging and kissing Cressida, or Cressie to her friends, while on the ski slopes in Switzerland. But they’ve not been seen together since. 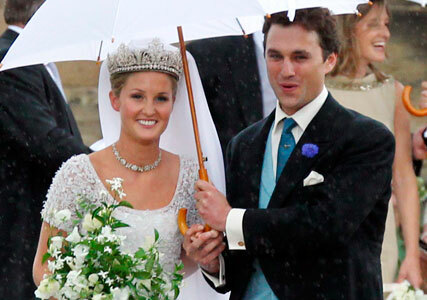 Still, there were plenty of famous faces for Harry to hide behind if he was avoiding an embarrassing run-in with Chelsy or Cressie – Princesses Beatrice and Eugenie attended the lavish ceremony, as did Holly Branson and Tara Palmer-Tomkinson. 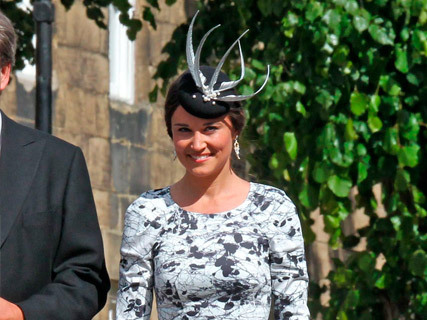 Standing in for Kate Middleton alongside Prince William was a gorgeous Pippa Middleton, who wore a stunning black and white peplum dress by Tabitha Webb.